This stop is definitely hard to pinpoint with any degree of certainty as the building no longer exists having been severely damaged during World War II. 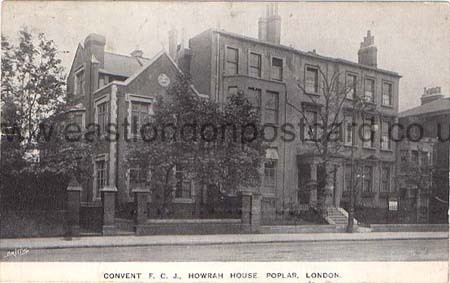 After moving to Limehouse in 1907, Alfred Hitchcock attended secondary school at Howrah House – a Catholic facility run by the Sisters of Faithful Companions of Jesus. Though largely considered an educational facility for girls, boys were often accepted. What is hard to ascertain is where exactly number 83 on East India Dock road would have resided in 1910. The damage caused during the air raids of the second world war would have certainly caused changes to the road upon rebuilding. The current number 83 is situated opposite a market and shops. Upon investigating the area in person myself and Gemma concluded that a small recreational green on East India Dock Road could have been a likely location for Howrah House. We deduced this both with the green leading onto a primary school and the adjacent Saint Mary & St. Joseph Catholic Church on Upper N Street. This could be complete hooey on our part and in turn may be due to us being lured by the swings out front. It’s something that we will investigate with local records over the coming months. Regardless, if you place a pin between the area we deduced and the current number 83, you will be able to retrace the footsteps the young Alfred Hitchcock would have taken to walk too and from school and his home in Salmon Lane. If you take our recommended location for the time being then it would also make an ideal location to stop and enjoy lunch (and those swings) on your own walk of the area!